I recently came across this 1971 clip of "Kitten Kong" taken from an episode of the British comedy series, "The Goodies." A plot synopsis explains that one of the characters gives a growth enhancement mixture to a kitten named Twinkle, who then goes on to unleash a reign of (adorable) terror throughout the city of London. 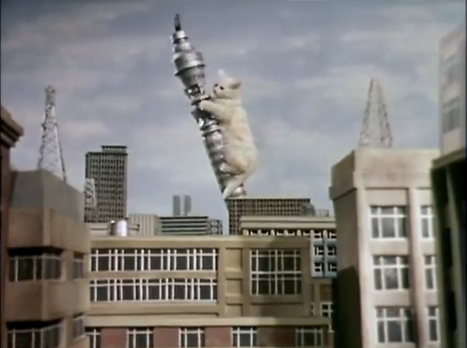 In the end, the Goodies come up with an antidote to return the kitten to normal size, however they must disguise themselves as giant mice in order to administer it. ...brings new meaning to the phrase 'Power of the Paw', hahameow! That is hysterical. Thanks for the laugh!